What is known about manta rays? The research focused on manta rays is still very young and there is great anticipation for the knowledge it can shed. Only in 2009 it was announced the discovery of a second species of manta ray, and possibly will be reporting on a third species. Many years ago there were many misconceptions about manta rays. To begin with, it was thought that the seas harbored a single species. People used to fear these beings in view of their enormous size and thought they were dangerous animals to humans. In the 70’s, divers who encountered these giant marine animals realized that they were not looking to attack, and the collective perception began to change favorably. The world is continually changing, that’s for sure, and most of the knowledge about nature is the result of observations and scientific studies encompassed in activities of scientific research. Manta rays are important components of the marine ecosystem but are also gentle and charismatic creatures, which tend to show an intelligence that hasn’t been observed in detail in elasmobranches or cartilaginous animals. Just as species of proven intelligence like whales and dolphins they often jump out of the water and 3 reasons are considered for this: to eliminate parasites from their skin, to communicate or for play, the latter two are related to a significant cognitive capacity. So far, numerous studies have focused on the investigation of their biology, including anatomy, morphology, genetics, distribution, habitat and food. In 2009, researcher Andrea Marshall revolutionized the taxonomy of the genus Manta to disclose the existence of two species instead of one, with marked differences in the color pattern and size. A basic thing you need to know to distinguish both species is that the giant manta ray (Manta birostris) is clearly larger than the reef manta (Manta alfredi), with a width of up to 9 meters. The same researcher created the first global database of manta rays, called Manta matcher. In July 2014 researchers from Stanford University realized that the manta rays in Hawaii usually enter lagoons to consume plankton in the area. According to these scholars, lagoons could be key factor to the conservation of the populations that are affected in their marine habitats. 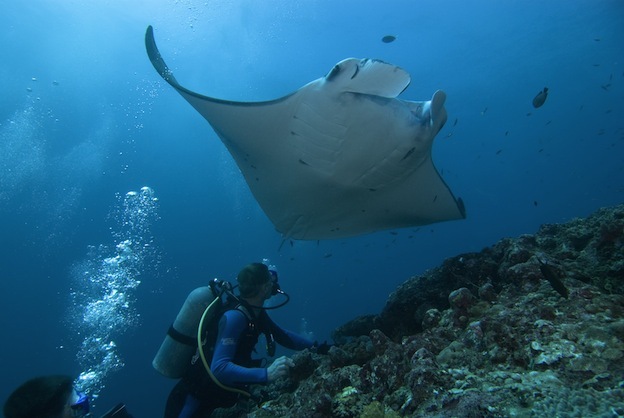 Experts studying manta rays often spend much time in the water, diving near them. They usually have to stay to one side, because it is dangerous to stand behind and in front as they can be damaged. Their individual color patterns should also be monitored through the use of photography to recognize each one. It is believed that the larger the brain of an animal is, the higher its intelligence. Manta rays have the largest brain of all fish based on the size of their bodies, and are probably smarter than you think. A simple experiment to test intelligence is putting an animal in front of a mirror. If the individual shows signs of recognizing itself, it is considered a being of superior intelligence compared to others. This test was carried out with manta rays, which spent much time near the mirror in the process; however, the results have been inconclusive. The more it’s discovered, the more questions and new lines of research are born. What has been found so far is only a fraction of what could be known. The less abundant information is that related to their breeding habits, their intelligence and their social relationships. Investigations allow for greater and better understanding of their life and the importance they have for the marine balance also provides relevant data to help establish conservation efforts.